Siberian Husky Dogs - The Siberian Husky is a working dog breed that originated in eastern Siberia. The Siberian Husky is a medium-sized dog. Siberian Huskies are a resilient breed; known for their ability to thrive in the arctic cold, they can work and live in temperatures as low as negative 75 degrees Fahrenheit (-60ÂºC). They were originally bred by the Chukchi tribes for use as a village dog to accomplish such tasks as pulling sleds. This information is licensed under the GNU Free Documentation License. It uses material from the Siberian Husky article on Wikipedia.org. Siberian Husky Breeders - Advertise your kennel puppies and dogs here. Hudson's Huskies & Malamutes - Tennessee - AKC registered Alaskan Malamutes and Siberian Husky pups. Shipping is available. Howl'n Wind Siberians - Wisconsin - Breeder of American, Canadian and International Champion Siberian Huskies for show, sled or a genetically sound family companion. 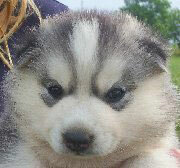 Will ship in the U.S.A.
Siberian Snowdogs - South Carolina - I am a hobby breeder of the Siberian Husky. I only breed 1-3 litters a year. Pups come with tons of extras to go home with. Check out the pictures of my pups and email me for more details. AKC Siberian Huskies - Ohio - Small show kennel of AKC Siberian Huskies located in Northeastern Ohio. Written health and genetic guarantee with each puppy.